Dr. David Cutler, author of the 2010 book “The Savvy Musician,” visited the University of Central Arkansas as artist in residence Feb. 19-21. During his first night at UCA, David Cutler and his music were featured in “Concert and Conversation: Borrowing, Stealing, and Breaking the Rules” at 7:30 in the Snow Fine Arts Recital Hall. “Concert and Conversation” was reimagining what music can be. The event began at 7:30 in the Recital Hall and featured several of Cutler’s compositions. 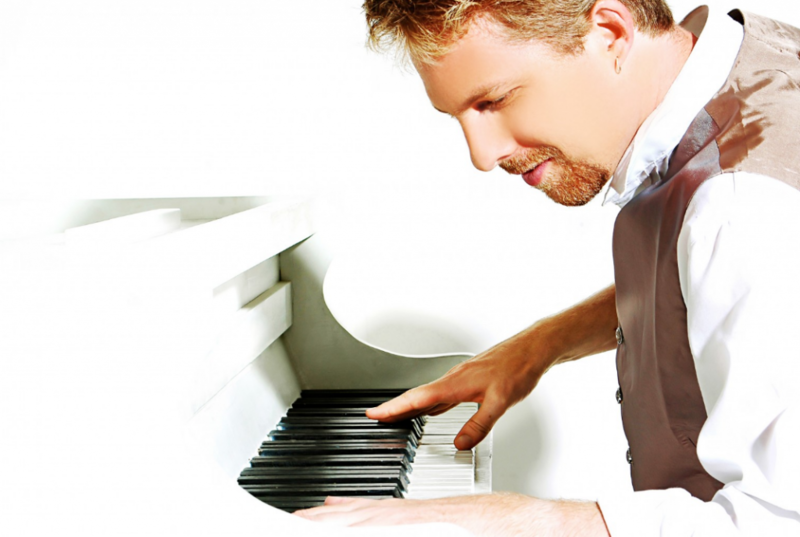 Cutler balances a varied career as a jazz and classical composer, pianist, educator, arranger, conductor, collaborator, concert producer, author, blogger, consultant, speaker, advocate and entrepreneur. In fact, a recent career diagram illustrated that he maintains no less than 24 income streams! Cutler is director of Music Entrepreneurship at the University of South Carolina, and he also teaches there. Cutler, one of the world’s leading voices on arts career and entrepreneurship training, has offered ground-breaking seminars for organizations such as the Julliard School, Dutch Classical Music Meeting, New World Symphony Orchestra and Chamber Music America. In 2013, he founded The SAVVY Arts Venture Challenge, an experiential workshop that trains participants to innovate, collaborate and build arts-businesses from the ground up. In June 2016, he directed a College Music Society Summit focused on the future of 21st century college music schools. Feb. 19, 7:30 p.m. — Public concert featuring compositions by Cutler performed by UCA music faculty in Snow Fine Arts Center Recital Hall. Concert includes a conversation on creating innovative experiences and opportunities in music. 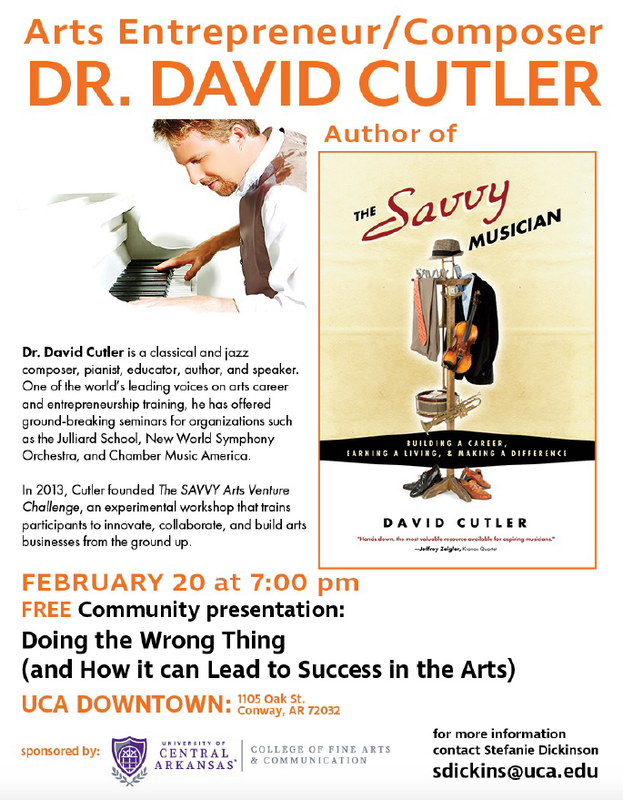 Feb. 20, 7 p.m. — Community presentation: “Doing the Wrong Thing and How It Can Lead to Success in the Arts” with Q&A and reception, UCA Downtown, 1105 W. Oak St., Conway. Feb. 21, 10:50 a.m. — Public presentation: “How Music Education Can Change the World (and Why it Often Doesn’t),” Snow Fine Arts Center Recital Hall. Feb. 21, 1:40 p.m. — Public presentation: “A Life in the Arts: Nine BIG Ideas on Career and Financial Success,” Snow Fine Arts Center Recital Hall.